In February 2018 ScandeNOx got an order for a dual level, urea-based SNCR system through a Danish boiler manufacturer. The SNCR system is now installed on the 8 MW straw-fired district heating boiler Langeland Fjernvarme in Denmark. The SNCR system was commissioned in December 2018, and has successfully brought the NOx emission below 150 [mg/Nm3, d, 6 % O2]. 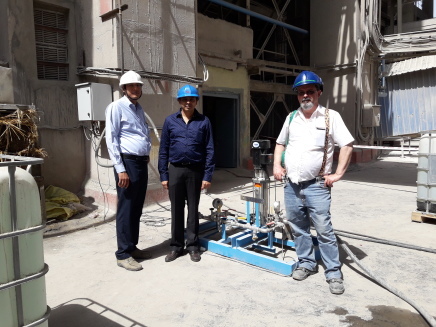 This system was the fifth SNCR system supplied to the same boiler manufacurer - who placed the order for SNCR systems # 6 and 7 from ScandeNOx on January 25th, 2019. Only satisfied customers are that loyal ! In January 2018 ScandeNOx upgraded 3 SNCR systems for Waste-to-Energy plants by supplying spare parts for injectors of new and improved design. The SNCR systems were originally supplied to the client - Hangzhou Lvneng, China - in 2013, by one of our competitors. 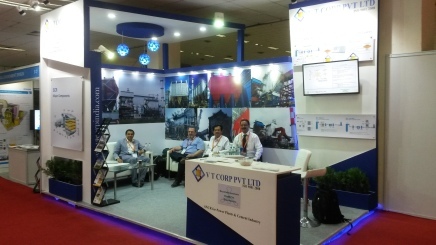 In May 2017 ScandeNOx's CEO visited one of our partners in India - VT Corp Pvt. 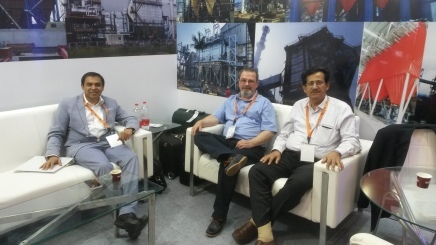 Ltd. - to participate in the Powergen 2017 conference in New Delhi, and to conduct SNCR tests on a 4000 tpd ILC kiln for grey cement at Shree Cement, Beawar. 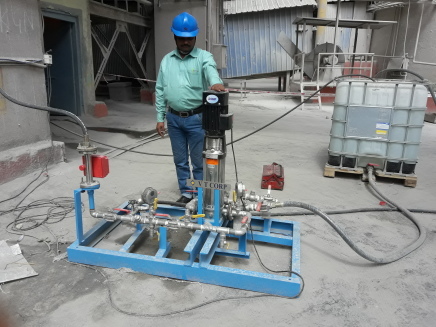 ScandeNOx supplied the injectors, and VT Corp supplied the pump module with flow indicator, flexible hoses etc. needed for carrying out the trials. 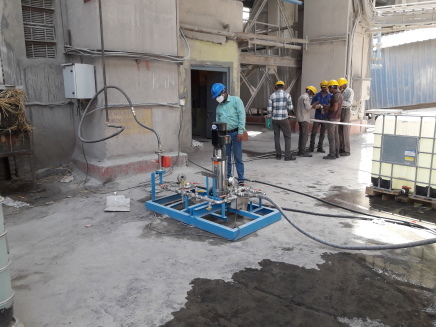 The system was mounted and pressure tested on the first day, and parametric testing was carried out during the 2 following days. The tests showed that the achieved NOx reduction and reagent consumption were as predicted by ScandeNOx. This plant was ordered by the below mentioned Danish boiler manufacturer in November 2016, and the main components were supplied at the Client's address in December. The plant is a standard ScandeNOx Micro SNCR system, supplied with urea from plastic cubicles, and is due for commissioning in March 2017 at the End User in Slovakia. This is the smallest Micro SNCR system supplied by ScandeNOx so far. The flue gas flow is a mere 2750 Nm3/h on dry basis and at 11 % O2 - but it is designed for an impressive NOx reduction of 65 %. These plants were supplied to the below mentioned Danish boiler manufacturer in 2016. ScandeNOx supplied the engineering and the main components - while the boiler manufacturer assembled the equipment and installed it on site. The plants for this project are dual level Micro SNCR systems for urea solution - assembled in single cabinets - one for each boiler - installed at an End User in China. This plant was supplied to a Danish boiler manufacturer in 2015. ScandeNOx supplied the engineering and the main components - while the boiler manufacturer assembled the equipment and installed in on site in Spain. The SNCR system was the first in a series of 6 similar plants to be supplied under an agreement with this boiler manufacturer. This Client has been very loyal to our CEO, ever since he conducted the first SNCR trials on line "RDL2". These trials lead to an order for a permanent SNCR system, and when our CEO moved to a new employer, the Client ordered trials on line RDL1 and RDL2 from this company - on condition that our CEO would be the project manager. These trials resulted in orders for an SNCR system for line RDL1 and upgrading of the system for line RDL2. 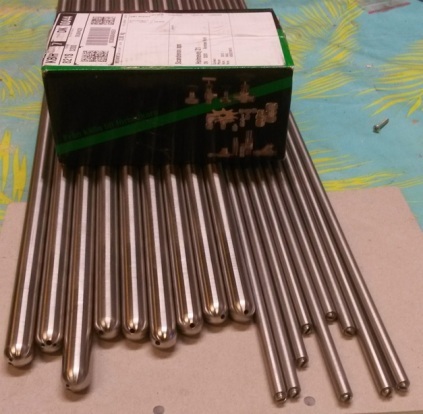 Finally, when our CEO started ScandeNOx, the Client ordered the shown system for his production line in Har Tuv, and gave us a contract for future services as well. Only satisfied clients are that loyal !